A perfect getaway from the weather’s whims, the crackle and warmth of Moran’s fire draws a sigh of contentment from patrons. Throughout the beautiful, dark-wood-paneled surroundings, in the firelight glow, every object seems to tell a story. The Irish restaurant and bar on 10th Avenue has seen a lot of neighborhood changes through history’s ebb and flow. Irish it is, but it’s far from being one of those dime-a-dozen watering holes where a certain brashness and the lingering scent of beer are commonplace. Though it has been open since 1954 as Moran’s, the space goes back to the Civil War era, and the handsome cherry wood bar dates back to Prohibition. The Tiffany lamps, and their warm, filtered glow, and the extensive display of Waterford crystal, passed on over the generations, are a draw for the eyes. “Europeans come in here, and they immediately fall in love with it, because it’s all European—and that’s a reflection of my parents and grandparents who came from Europe,” said owner Colleen Lydon. Not much has changed in the layout of the space, except for the location of the front door, which used to face 19th Street rather than 10th Avenue. But it has gone through different incarnations. In the 1930s, it was a speakeasy. It was also a rooming house. In days gone by, it had a more working-class tenor, with longshoremen taking refuge after a long day’s work of loading and unloading ships. It was very much a family affair. Lydon’s mother, her maternal grandparents, and three brothers migrated from Ireland. Her grandmother cooked, while her grandfather tended bar. “It was very different back then. The piers were right down the street—they were working piers, and the union hall was right down the street as well,” said Lydon. When sailors got a break they would head to Moran’s. “They would get off the boat, and they would have 10 days off. They would literally just spend their 10 days here.” With a lodging room upstairs and the bar downstairs, it was all they needed. Copper ice boxes are affixed to the side of the bar, a testimony to a time where the neighborhood was home to shops of welders. Moran’s has a number of artworks up on the walls, including three Irish watercolors, which Lydon treasures dearly for depicting the feel of Moran’s years ago—a casual, working-class atmosphere. In the back of the restaurant, framed on the wall but almost hidden, is a piece made and gifted by a sailor, showing intricate knots. These days, the neighborhood is incredibly transient, said Lydon. Even 12 years ago, she said, it was a real neighborhood, where she knew generations of families. The changes in the neighborhood, as anyone who has walked around the neighborhood has seen, are still unfolding. Right around Moran’s, parking lots are turning into buildings. These days, in addition to its regulars, Moran’s gets a tremendous number of tourists, thirsty and hungry after a stroll on the High Line. And so the menu, which offers traditional and contemporary American fare, tries to cater to both. “You can come in and have a steak, and you can come in and have a hamburger. You can come in and have Chilean sea bass, or you can come in and have a fish cake,” explained Lydon. Lunch is also more casual—lots of sandwiches and hamburgers—while dinner is fancier: “Wiener schnitzel and osso bucco, and things like that,” she said. Because of this, there is something for almost every taste, which is always nice when going out with a group of friends. One of the most popular items and justifiably so, is the lamb chops ($16). Tender, well-seasoned, they’re either great to satisfy a small craving, or else will whet your appetite for larger dishes to come. Steamed mussels ($12) have a little unexpected but pleasant kick to them. If you are more inclined toward something greener and less meaty, a blue cheese salad, with a light vinaigrette and red onions, is addictive on its own. 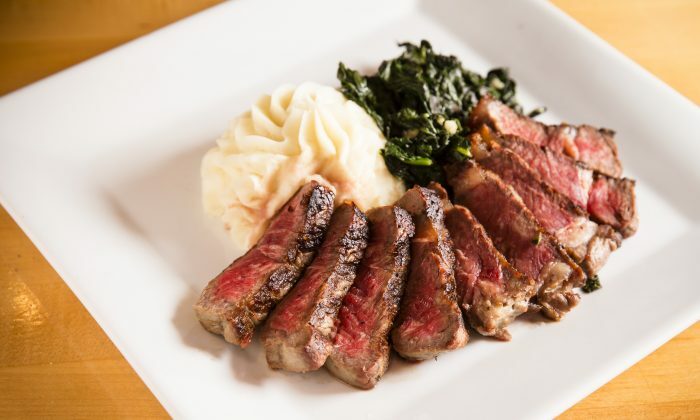 For the heartier appetite, the New York strip steak, served with sauteed spinach and baked potato ($37 dinner, $34.50 lunch), fits the bill. Whichever dish or drink you choose, it’s a cozy experience, made more special by the historic feel. Moran’s is offering a St. Patrick’s Day menu at $62 for a three-course dinner. Entrees: corned beef and cabbage, filet mignon, or grilled salmon. Appetizers: potato and leek soup or green salad with pear and almonds. Selection from dessert cart. Sunday & Monday 11 a.m.–11 p.m.